Sofia Chaudry is an Assistant Professor at the Institute of Chemical Engineering and Technology, University of the Punjab, Lahore. She obtained her Bachelor in Chemical Engineering from University of the Punjab, Lahore in January, 2005. 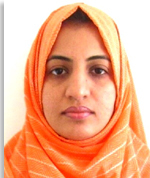 She joined the University of the Punjab as Lecturer in March 2005. She also obtained her Masters in Chemical Engineering in 2006 and was awarded gold medal by the University of the Punjab. Currently, she is pursuing her PhD studies at Murdoch University, Australia in area of renewable fuel. In 2015, she was announced as the Asia Pacific PhD Champion based on the innovative idea to solve the global future mobility challenge presented by her and another team member in Asia pacific PhD Challenge competition conducted by the world’s largest chemical company, BASF.